119 min. Warner Brothers. Director: Nora Ephron. Cast: Tom Hanks, Meg Ryan, Parker Posey, Dave Chappelle, Greg Kinnear. Ya wouldn't think You Got Mail would hold up over a decade after its release—during a year defined by The Social Network, no less—but darn if it doesn't. Nora Ephron's treatment of harried professionals finding love on the internet also proved that The Shop Around the Corner still held up after fifty-eight years, since Ephron reworks the basic premise of Ernst Lubitsch's romantic comedy: changing love letters to emails, Ephron worked out a trendy light farce best served with good old fashioned movie stars. Lubitsch had Margaret Sullavan and Jimmy Stewart, but let me tell you something: Meg Ryan and Tom Hanks are not to be sneezed at, especially in a sentimental comedy like You've Got Mail. The reteaming of Hanks and Ryan—after 1990's Joe Versus the Volcano (1990) and Ephron's rom-com megahit Sleepless in Seattle (1993)—elevates the corny, but so does Ephron's particular brand of breezy dialogue, co-written with sister Delia. Ryan plays Kathleen Kelly, proprietress of a children's bookstore that's a Manhattan institution (called, in a nod to Lubitsch, "The Shop Around the Corner"). Hanks is Joe Fox, the upwardly mobile overseer of a corporate mega-bookstore chain. In actual space, Kathleen fears and loathes Joe for being crass and competitive, a direct threat to her livelihood and family tradition. But in cyberspace, Kathleen and Joe are carrying on an emotional affair by trading emails under their AOL screen names, "Shopgirl" and "NY152." By day, they bicker, and by night, they swoon at each other's sensitivity and smarts. Their curiosity about meeting in real life is tempered in part by fear of breaking the spell and partly by their current, if stale relationships, Kathleen with New York Observer columnist Frank Navasky (Greg Kinnear) and Joe with high-strung career girl Patricia (Parker Posey). The story takes a predictable course through the highlights of The Shop Around the Corner (and its musical remake In the Good Old Summertime), but Ephron adds her own clever innovations. One of the film's virtues is a determination to ground the story in a recognizable reality: it's almost enough that the internet works as it does in real life (a rarity in '90s movies), but the lives of the protagonists have a credible rhythm to them, as does the course of the clash between corporate and independent booksellers. That subplot and the well-honed dramedic performances by endearingly mock-cranky Hanks and quirky, cryin' Ryan add just enough weight to what might otherwise float away; the Ephrons also show a good knack for depicting the gender differences of men and women without offending half of the audience. Lending solid support is an ensemble including Jean Stapleton, Steve Zahn, Heather Burns, Dave Chappelle, Dabney Coleman, John Randolph and Jane Adams, and cinematographer John Lindley gives a magic touch to the Upper West Side that serves as somewhat of a wink and a nod to the fantasy side of the enterprise. If only for two hours, you will believe that love is just around the corner. Warner sends along You've Got Mail in a Blu-ray + DVD special edition that doubles its value by including The Shop Around the Corner (on a DVD complete with its original bonus features). In its hi-def debut, You've Got Mail has a somewhat inconsistent look but makes a good impression overall, handily besting its standard-def issues. Color and contrast step to the fore here, and while the visual style tends to a somewhat soft look, detail is quite good and textures are palpable. Black level could run deeper and there's some digital artifacting (some ringing, most notably), but the film looks better than ever on home video, so there's little reason to complain. The DTS-HD Master Audio 5.1 surround mix is what you'd call serviceable: not a lot of surround activity, but clean and clear. Previous DVD features return, beginning with a nicely chatty commentary by director/co-writer Nora Ephron and producer Lauren Shuler Donner. We also get "HBO First Look: A Conversation with Nora Ephron" (14:20, SD), Interactive "Discover New York's Upper West Side" Map Tour, a Carole King "Anyone at All" Music Video (3:12, SD) and an Isolated Score Track. 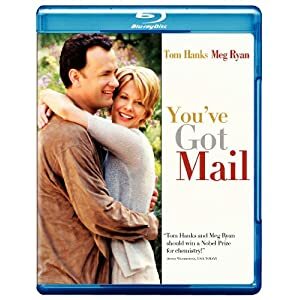 Returning from the 2008 Deluxe Edition DVD are "Delivering You've Got Mail" (25:28, SD), an enjoyable living-room reunion of Nora Ephron, Tom Hanks, and Meg Ryan, and "You've Got Chemistry" (26:16), a film-history overview of best-known screen couples. Also included is the film's Theatrical Trailer. At it's "nice price" and with The Shop Around the Corner included, You've Got Mail on Blu-ray will prove hard for movie fans to resist. All site content © 2000-2019 Peter Canavese. Page generated at 04/18/2019 02:35:54AM.